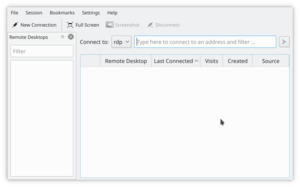 KRDC Desktop Sharing Client - Use this tool to connect your computer to a the desktop of another computer to provide assistance or do work remotely. The serving computer could use e.g. Krfb. Krdc is one of a pair of KDE programs - Krfb is the other. Krdc lets you log onto another computer remotely; either over a LAN or over the internet. Krfb lets you share your desktop through the local network with another user, probably somebody like the tech downstairs who you want to help you. Sharing your desktop can let her help you figure out something you are having trouble with. You can call the tech on the phone and be talking with her while she assists you. The tech can even "drive" your computer if you decide to let that happen. You can refer to the Krfb page to learn more about the Krfb/Krdc process. This explanation is, therefore, from the perspective of the technician who is going to work remotely as the "guest". The native protocol of the Krbf/Krdc connection is VNC. You will note that you, as a guest technician, can provide assistance to many different operating systems because the VNC protocol is widely used for desktop sharing. You are not limited to working with remote host KDE desktops; you can login to Windows and other systems as well. Type in your user name and then the login password that the host requires. This will be saved in Kwallet by default which means you don't need to login every time you connect. If you are a technician servicing a host computer, you may need a new password every time you login. When your mouse is within the window limits of the host's desktop, you can control the host computer. If you do not successfully connect to the host computer it may mean a mistake in typing the ip address. If the host's firewall is configured to block the needed port, then your connection will also be blocked. The port for the VNC protocol must be opened on the host computer. It may work out for the best if the technician does the initial setup of both computers, after which the host user just needs to click the appropriate sharing option when making the help call. You can bookmark a connection on the Krdc "guest" to save time with repeat tech help calls. You'll need to enter the new password for each desktop sharing session. But for connections on your LAN or to a remote computer say at a university, your account and password probably won't be changing and you can leave it saved in Kwallet. This page was last modified on 4 November 2017, at 16:53. Content is available under Creative Commons License SA 4.0 unless otherwise noted.